Give your crew a modern twist on the classic look! These canvas shorts give you the protection that you need while maintaining the comfort and feel of our original sailingshorts. With attention to detail, these shorts have become the contemporary look on yachts all over the world. 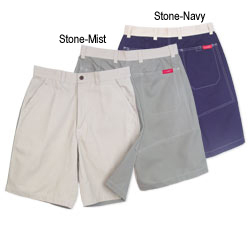 The Porto Cervo Shorts are made from 9 oz. brushed, soft cotton canvas. They have a relaxed fit with plain front, zipper fly, belt loops, two deep side pockets, and two stitched rear-pockets with Velcro closures. They are designed with a double seat for protection and gusseted crotch for full range of motion. Colors: Stone, Stone front and Mist Gray back, or Stone front and Navy back. Inseam: 9"